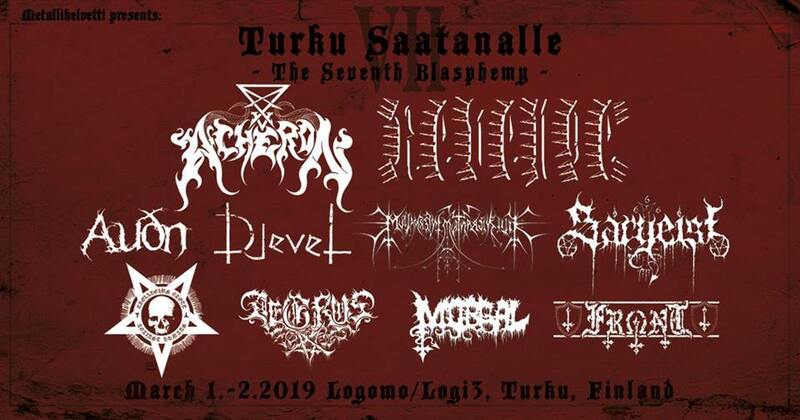 Turku Saatanalle – is the annual Black/Death metal event arranged in Turku/Finland. The festival has offered a lot of grim and barbaric bands from the wide field of the extreme metal. This year’s festival presents these following bands :AEGRUS, TROLLHEIMS GROTT, FILII NIGRANTIUM INFERNALIUM, AUÐN, ACHERON, MORGAL, FRΩNT, SARGEIST ,DJEVEL, REVENGE . Turku Saatanalle VII will be held at Logomo / Logi3 this year on the 1st and 2nd of March. This venue is a bit smaller compared to the previous one, the max capacity is ca. 450 persons. We recommend strongly to buy the tickets in advance to secure a fast and easy entrance. All tickets already bought are valid, of course. 1) What sort of expectations do you have for Turku Saatanalle this year ? Is there a band(s) that you are proud of having on the roster? Jussi: Looking forward to a full house of black metal fans enjoying this dark art in its various manifestations. Personally I think having Acheron to end their grandiose career at our festival is a nice milestone in our bookings so far cos I have been following them since the debut album Rites of the Black Mass. I didn’t actually believe they would be interested anymore to play live – cos I noticed their announcement about calling it quits AFTER I had contacted Vincent regarding the festival slot. So it was a cool surprise when he replied quite quickly and told they wanna play this final show. I’m also looking forward to see Filii Nigrantium Infernalium cos they are a band which could have deserved a bit more attention among the black/thrash metal fans. Also Morgal is recommended, they are relentless beasts on stage! 2) The festival offers a great deal of the barbaric death/black metal bands. How do you usually choice those bands and how did you pick up these bands for this year’s ? event ? J: It’s always a combination between “public demand”, personal intuitions and the offers we get from many bands and booking agencies. During the years, when the event has become bigger, we have had more budget and possibilities to book also so called bigger bands yet keeping the festival pretty much underground anyway. J: I’m sure for many it was the Vanhelga show, argh… Well, things happened. Last year Warloghe showed a perfect example of a black metal gig and how it’s done. Pure aural evil unleashed upon the hungry masses. 4) Is there going to be the next event in 2020 ? 5) How pleased are you with the line-up of the fest of this year ? J: We stand 100% behind each booking. The official Turku Saatanalle VII shirts are available for pre-order now! The picture shows all possible variations of the shirts, the prices and the sizes. The deadline for pre-orders is Wednesday, February 13th. Contact: jussi@metallihelvetti.net When ordering, state clearly the model and the size of the shirt you wish to pre-order. You can of course pre-order multiple shirts at the same time. Possible payment methods: PayPal and bank transfer. We will print shirts only according to the amount of pre-orders! You can pick up your shirt at the festival doors with your ID. Shipping is also possible, after the festival.